Crissy Field is San Francisco’s newest major park, dedicated in 2001. Originally an airfield in 1919, the field was the site of one of the earliest army airfields on the west coast. 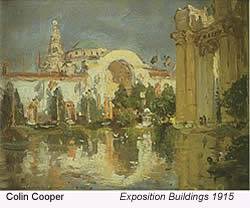 The western portion of the 1915 Panama-Pacific International Exposition was held here, including The Grand Prix. According the NPS website, “The winning auto reached the dizzying speed of 56 miles per hour.” In 1924, the first Dawn-to-Dusk transcontinental flight ended at Crissy Field, and the first flight from California to Hawaii started there. This morning, the area was shrowded in fog (and high, cold winds–brrrr), so I kept color saturation low, and went for harmonious grays throughout. The building shown here is Crissy Field Center. This view is not the usual painted. I’ve painted the domed building before, so decided to try another view. 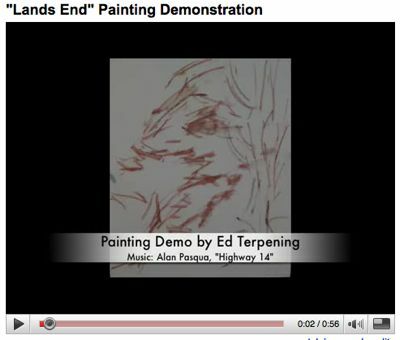 Roads and pathwayss are often used as compositional devices by artists (click here for a Google images search result to see some samples). After all, artist’s use principles of design to lead the eye within a painting, in order to maintain interest. A road is an easy way to lead the eye, because we’re trained to follow them. Generally, when I compose a painting, I think first about an eye pathway and leverage (or invent) directional elements that create interest. Lines that appear in nature like the shape of a tree, or the curve of a roof may be used to direct the eye, as well as roads. To demonstrate, take a look at this sketch made to prepare for a painting of the French village Simiane. The arrows I drew to the right of the sketch indicate the kind of eye pathway I think the design will create for the viewer. The painting below uses both literal and figurative roads to lead the eye. 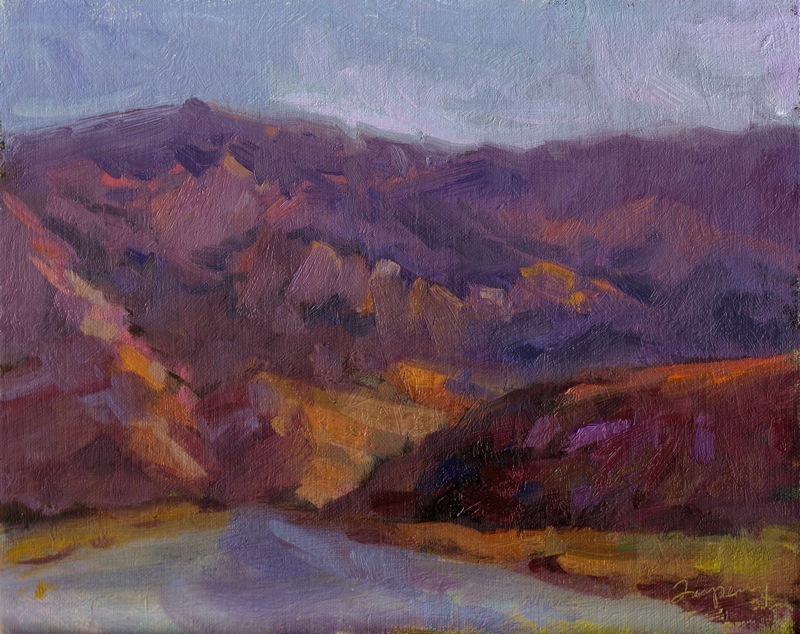 I believe the viewer will start in the lower right, where the road begins and invites them into the painting. Where the road ends, the viewer will likely head up, and follow the path of light hitting the distant hills, then head right to follow the mountain tops, then down again to the foreground hill. This is my theory. I remember years ago while at CNET we commissioned a study that actually showed where the eye first landed on a web page, and its subsequent movement on the screen. Our test subjects wrote a set of special eyeglasses that tracked the eye’s movements. Obviously, very useful information to websites that make their money on advertising. Hmmm…but you know, I guess I’m still in the same business. Is a painting an advertisement? I guess it is. It’s a product selling a sense of place and distraction from the everyday (like a movie). I think my shadows have been overly dark lately, so I’ve been seeking opportunities to “lighten up”. An old reference photo of “China Cove” in Point Lobos did the trick. The photograph was over exposed, so everything was lighter than it would have been otherwise. As I was painting this, the colors in the photo where washed out, so I also thought about pushing them further. I had a good time with this painting, and very happy with it. It has the sense of light I was looking for. I also reminds me of somewhat of Camille Przewodek’s colors. 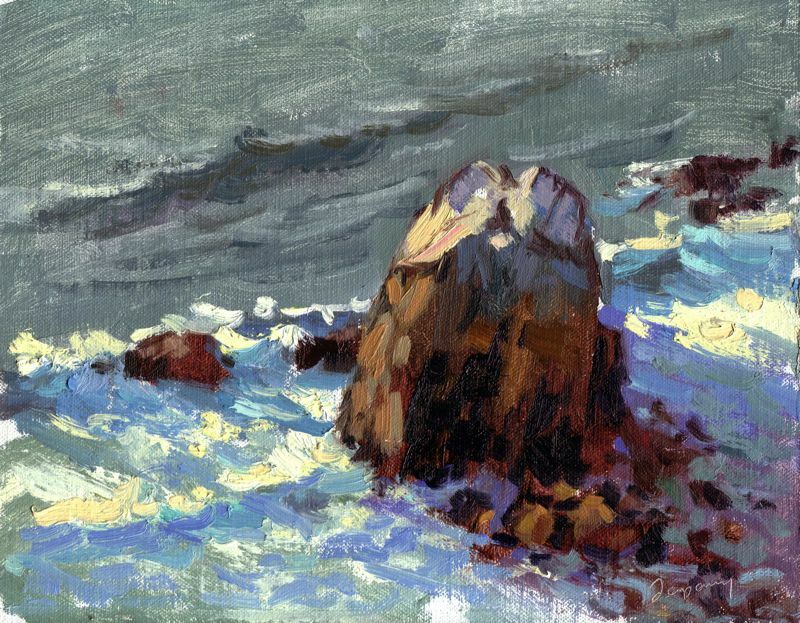 I tend to drift between schools of color, from Camille’s light key paintings to the more dramatic value changes of the Russian impressionists school. I think I’ll stay in this key for a while, and see how things go. Also, I took photos of the painting in progress, so created a little video (see below). Here’s a short video of the painting in process. Click to visit YouTube. Be sure to click “Watch in High Quality” link, lower right. We’re having incredible weather this week in San Francisco! I crossed the street yesterday to Buena Visa Park the oldest park in San Francisco on a great hill in the center of the city. 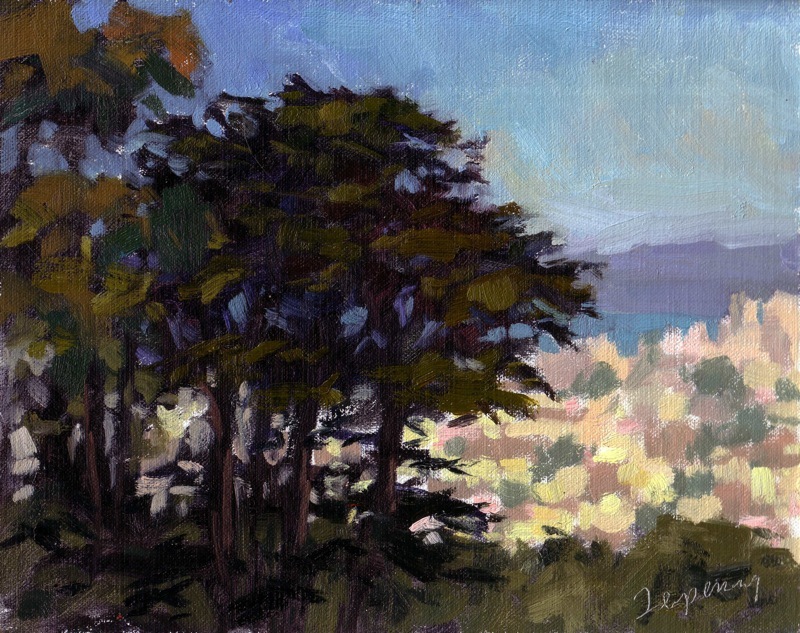 I hiked up near the top, where this great view of the bay and neighborhoods below made for a nice light backdrop for the shapes of the Monterey Cypress trees. I think this will make a nice larger work. A couple of things to note in his painting: 1) The city below is abstract, just dots of mostly warm colors, with an occasional blue green to represent distant parks/trees. The city was fun to paint, as I could place dots of color in a way that’s both pleasing, and reads well from a distance. 2) When painting the sky, I not only need to represent the value change from bottom (lighter, warmer) to top zenith (darker), but also from right to left. In this painting, the sun was on the right, so the sky is also lighter there. 3) One very difficult transition was from the distant hills to the bay. 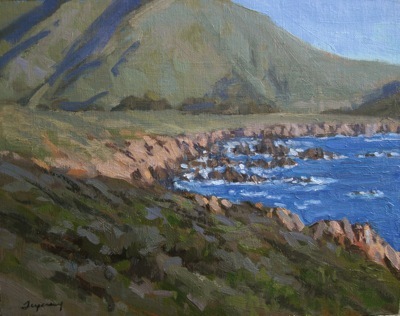 The values needed to be very close, so I needed to show the difference between water and land with a slight color shift. I’m very happy with this, although if i paint larger, I think I will alter the trees in the lower right, and make a more dramatic slope, to better give the feel of height of the park. 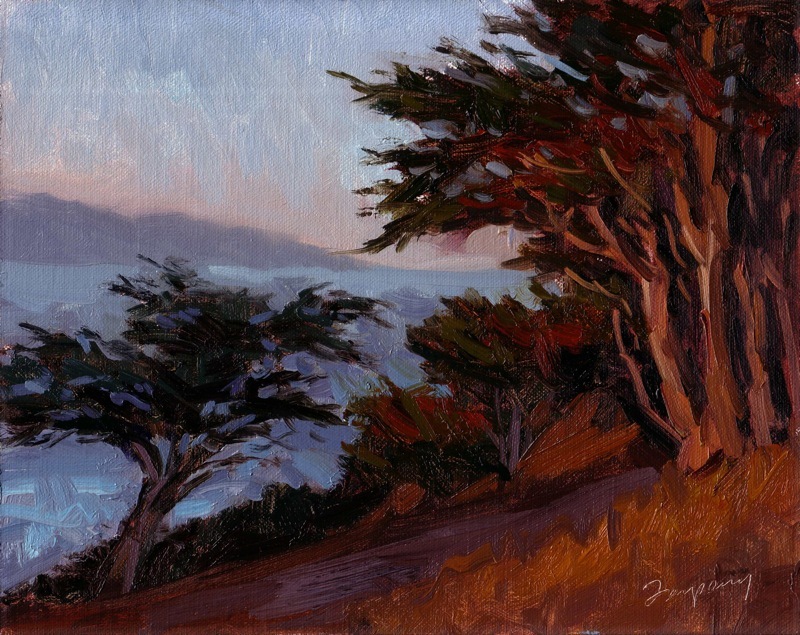 Here’s another study of “Lands End” (Golden Hour) I started in my previous post. 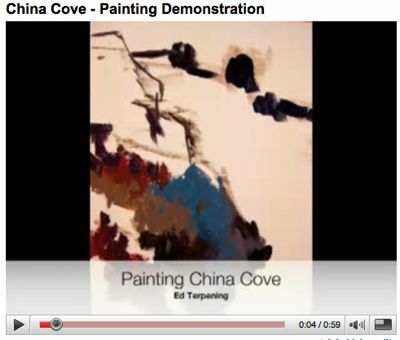 I created a video of the process, by stringing together still photographs of various stages of the painting. I like this composition. 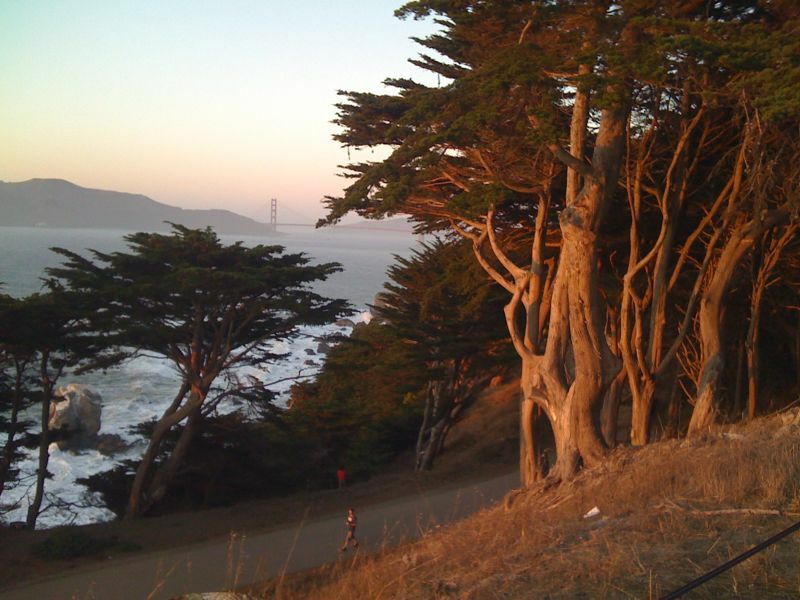 The large tree reflects the strength and gracefulness of the Monterey Cypress, but I’m not sure about my darks…they may be too dark. I may try another study today where I play with that a bit. Painting dark darks provides nice contrast with light (which I clearly needed here), but it can also make the painting too “heavy”. Click this screen shot to get the demo (be sure and click “watch in high quality” in the lower right corner of the video, a new YouTube feature. Last Sunday was a beautiful day for walking, and the far western edge of San Francisco (known as “Lands End“) was striking the last hour of the day (“Golden Hour“). 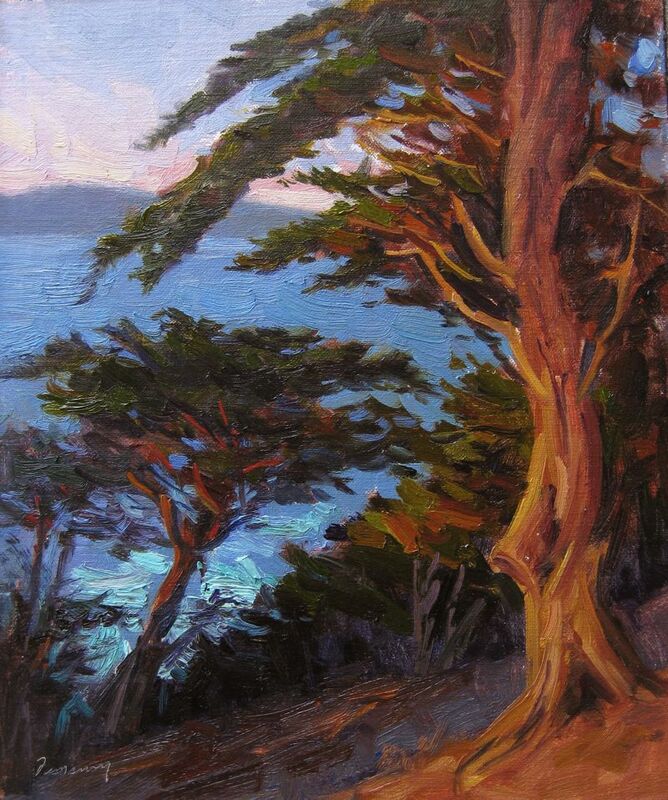 A couple of things attracted me to this scene: the light, subject (Monterey Cypress trees, my favorite!) and the shapes made for an interested composition. Below, you’ll see the reference photo. Notice I edited out a few things. An artist’s ability to edit his own ideas is an incredibly key skill. A work that tries to communicate too many ideas, ends up communicating nothing. Any Project Runway fans out there? You hear the judges warning contestant designers about editing their own ideas all the time. It’s evident when a model comes down the runway whether or not the designer is able to focus on a single, powerful idea, or whether they’re show-boating, and throwing in every technique they’re capable of. The Golden Gate Bridge is one obvious omission. I tried putting it in, but, it didn’t work. As a man-made object, it drew a lot of attention, and it’s too small and not a good shape or position to be the center-of-interest, so why lead the eye there? 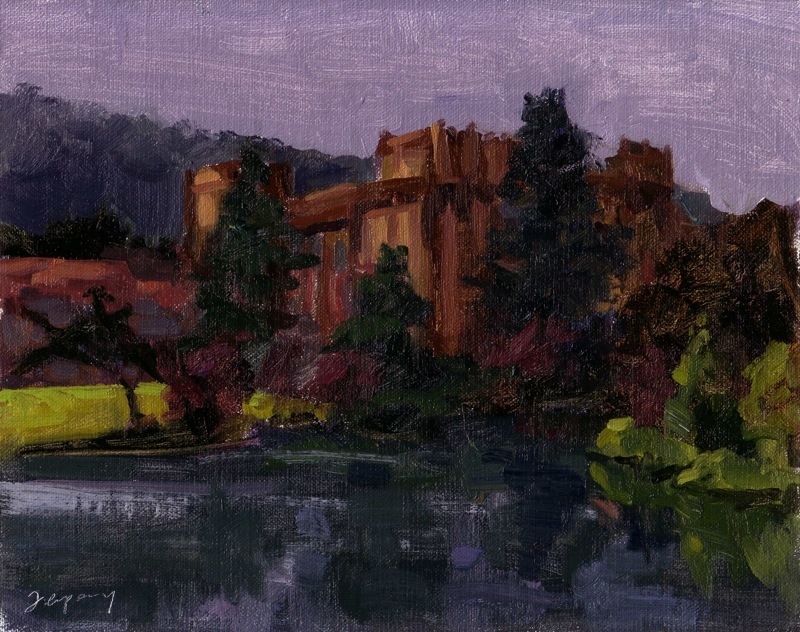 Second, if the scale of the painting where larger (this is an 8×10 study), I may have been able to get it to work, but at this size, it’s difficult to paint a structure like that and maintain the loose brushwork. I would have had to use a small brush, and the texture alone would have detracted from the texture in the rest of the painting. I really like the photos I took that day, so I’ll definitely paint more, larger works in this vein. This painting presented a number of challenges. I needed to represent three areas of distance: foreground, middle ground and distant background. This required careful control of values and color, especially hue intensity and temperature. As objects recede, a number of things occur, and you generally need to push each of these aerial perspective principles a bit to get your image to read well in the two-dimensional space of canvas. First, colors change, generally getting cooler (as the layers of moisture in the air add blue), but they also change by hue, getting less intense. The level of intensite is different, depending upon the color: Yellows drop off first, followed by red, then blue. In addition to getting cooler then, they also loose hue intensity in that order (yellow, red, blue). The second big change is values: values come closer together as space recedes. Even so, you must keep your light and shade areas distinct, ie, all objects in light must be lighter than all objects in shade, and vice versa. Given these general principles (follow or break them to meet your needs–do what works for you), the color of the ocean was particularly challenging. It was very intense, so more difficult to show recession in space. As you can see, the blue of the water here is the most hue rich of everything else in the painting, and yet I needed to represent both foreground and distant water surface area. The distant area is slightly lighter and duller, in this case. I’m not sure it reads well as distance, but let me know what you think. Sunday was warm, clear and little wind, so a great day to paint the coast. I wandered over to an area I like generally referred to “Lands End” (here’s a Google Maps aerial view). On days with clear sky, you’ll notice that the shadows are quite blue as the sky color reflects directly on shadowed flat planes. This was really easy to see on this day, particularly since the white water provided the perfect platform for viewing clearly the color. One art teacher used to have us place a white piece of paper on the ground, part in shadow, part light, to judge the color of shadows and light that day. The other observation I had was the color of the light, and again, the white water played the role of that white paper on the ground. The color of light was yellow, and of course as the afternoon progressed, it picked up more orange (I finished this in about an hour). Painting a single monolithic object is a challenge compositionally. I certainly didn’t want to place the large rock in the center of the canvas. I used the “thirds approach“, and so placed the center of interested at roughly the verticle and horizontal thirds of the canvas. Once I’d decided on the lower right, I needed to balance the space out with other rocks. Luckily, the lower left rock was actually there, but I improvised others. I dulled out and simplified the top half of the painting to provide a neutral backdrop for the lower half center-of-interest, high-saturated colors. Another challenge here was the fact the rock was multi-colored. I couldn’t really tell whether the top was white from “bird contributions”, or weather it was a different type of rock. Probably the former. With the top half white, and the bottom warmer earth colors, I needed to ensure the light and shadows read properly. So, the shadowed side of the top of the white rock had to read as white in shadow. I needed to keep it just slightly darker than any of the planes in light. I also needed to ensure I didn’t duplicate that color with the white water shadow color. I’m always very careful not to repeat two color/value combinations in a painting for different objects. It doesn’t (rarely) happen in nature, so it shouldn’t here. The shadow side of the white rock is a dull, blue violet, whereas the white water has more saturation and color variation. 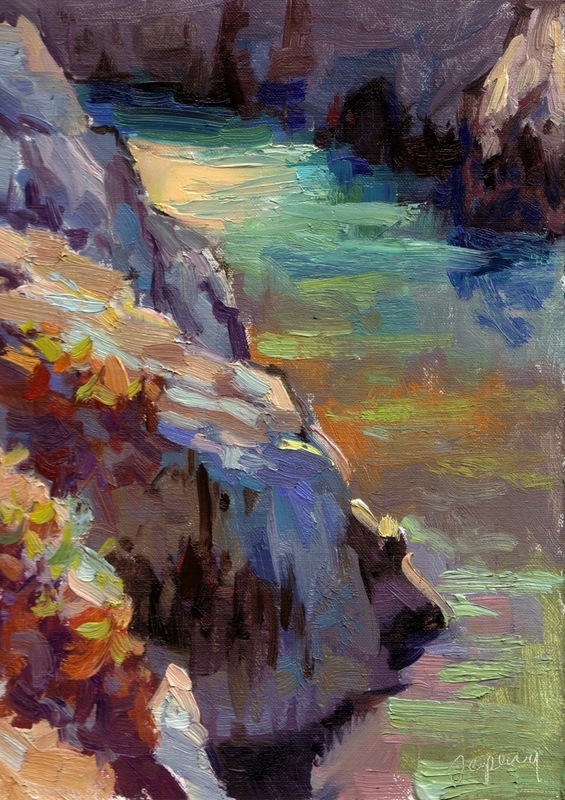 I am headed to Russian River today for the weekend, and hope to get some painting done along the coast, or who knows, maybe figures around the pool at the RRR! This is just a little figure study I did from a photo book. 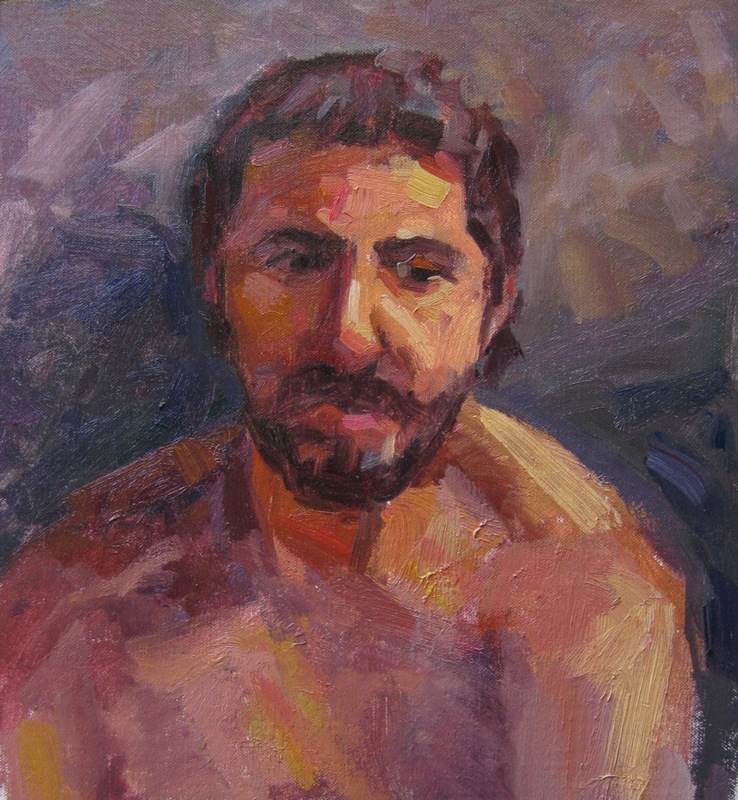 I am looking forward to painting live models in the next few weeks when David returns from Latin America. Painting the figure is by far the best way to learn to draw. I drew the figure a year with charcoal and newsprint before I first picked up a paint brush, in 2001. Drawing and values are the foundation of representational painting. If you are interesting in purchasing, email me an offer. Looking through my reference photos last night, I can across photos of China Town, here in San Francisco. I did paint a plein air piece there a few months ago, but wasn’t that happy with it. It can be difficult for me to simplify while out doors (the distractions: weather, tourists, pressure for time with the changing light, etc). 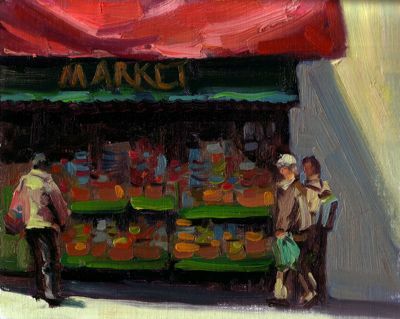 Being able to simplify and absorb the essence of a city scene is a critical skill. 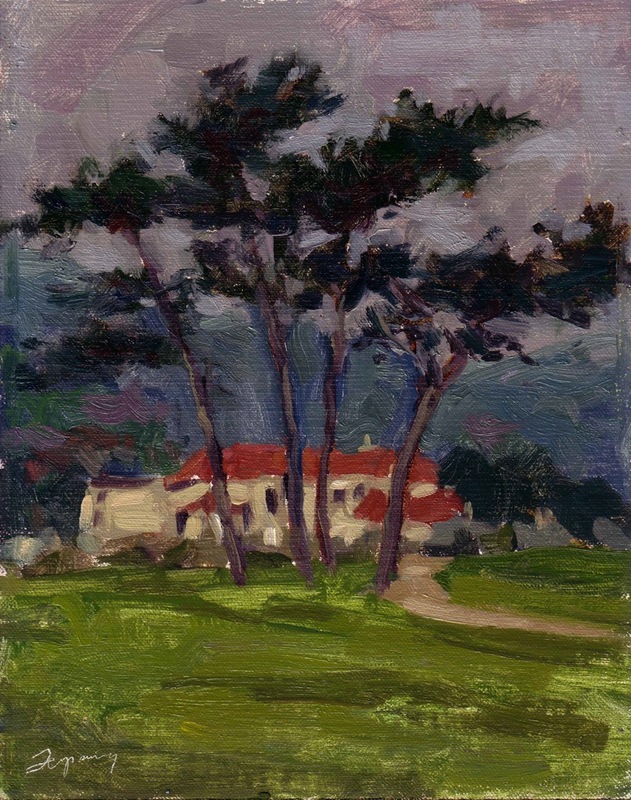 One artist that does this particularly well is William Wray (see here, here and here). Like William, I’m a fan of the Russian painters, particularly Nicolai Fechin. His brushwork is amazing. Maybe, someday, I’ll paint with that level of confidence. He combines that with his ability to see the beauty in any urban scene. In any case, this painting is one step towards my goals to be a better painter. In light of that, I’m happy with it. Enjoy! Even with David (the artist I share models with) out of the country, I decided to continue my painting of model Manuel–without him present. Of course normally, this is a huge “no-no”, but I was focused on the background, so I think it’s looking good. Might just call it done, and work on something else next time I paint him. To compare, this is the original image, and here’s another study completely.